It’s a phrase we say every time we recite the Lord’s Prayer. Many of us don’t even think twice about the meaning. In the US bread is often a side that accompanies “the good stuff”. Except biscuits, of course. They’re a southern staple. Anyway, in France in particular and largely Europe in general bread IS the good stuff. It’s part of every meal and on many occasions is the meal. Well, maybe that and some cheese and a demi-litre of wine. 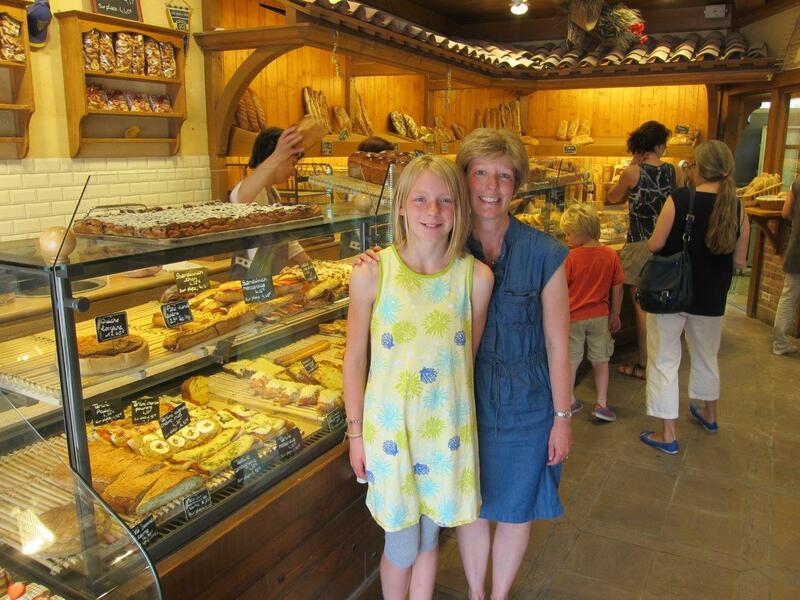 This is a pic from our favorite boulangerie (bakery), about a mile and a half from the house in downtown Chamalieres. We didn’t make it there every day but somebody usually ran through at least three to four times a week. It was awesome. There were always tantalizing fresh baked goods in the display case to taunt you while you waited in line. Pain aux chocolat (bread with chocolate) and croissants for breakfast, gourmet pizza slices and baguette sandwiches and quiches for lunch, tarts (pies) and pastries for desserts, and of course, fresh bread. LOTS of bread. Baguettes, baguettes with sesame or multi-grains, wheat bread, buttery brioches, sourdoughs, and the most awesome pain aux cereals (multi-grain bread) I’ve ever had. Sarah’s Easter sheep. Just go with it. Did I tell you they did sweets too? 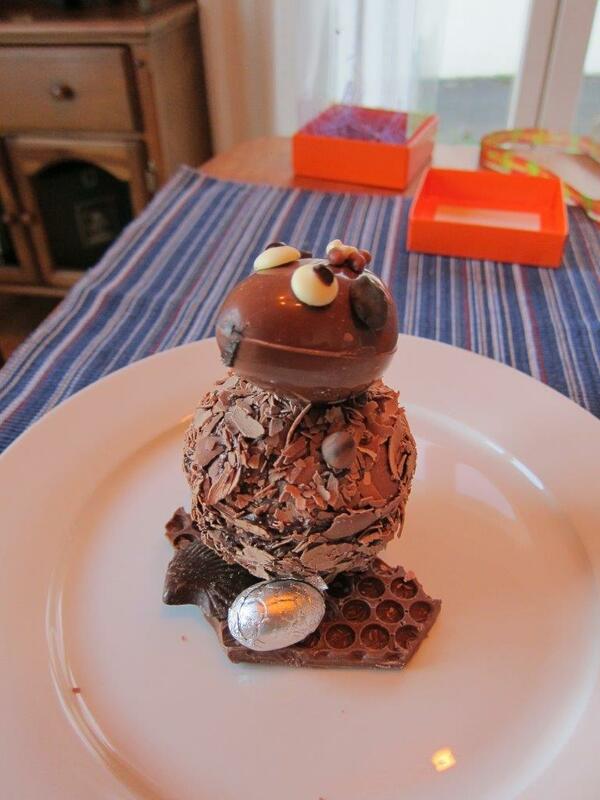 This was an Easter sheep Sarah discovered in her basket. There were two Maison Vacher locations in Chamalieres. The bigger one had a few tables where one could settle in with a cafe and a croissant and enjoy a leisurely morning or quick lunch from the counter. Unfortunately we never found the opportunity to stop and enjoy it. Where did the time go? The ladies that worked there were so nice, even when the line went out the door. 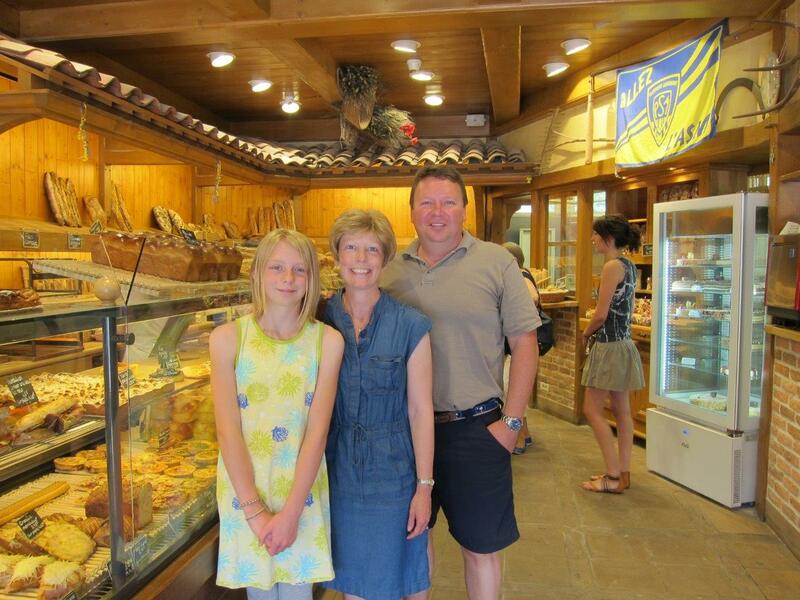 They even stopped to take a family portrait for us when we dropped in to say goodbye and take a picture! Kate dropped her wallet there once and didn’t realize it until later. The manager went back through the security tape to discover who had mislaid it and had it waiting for her when she raced back in all in a panic. Give us this day our daily bread. For us a phrase. For the French a way of life. Literally such an ingrained part of daily life that to skip it would be almost unimaginable. Even today the common baguette and “pain de campagne” (country bread) can be found in almost every shop, grocery, gas station mini-market, etc. that sells food. To understand the significance brings so much more to the appeal in the prayer. Greetings from Greenville, SC, USA. It’s been just over three months since we returned to the states. We miss the bread. We miss lots of things but on the other hand it’s good to be back among the familiar again. I suffered a “settling in” delay getting my posts out but I’ll try to be more prompt. Stick around, I’ve still got a few left to do before the show is over. Au revoir. Previous No Tea in England? ?